Every year around Halloween I get a case of War of the Worlds fever. Now, as much as I love it in all its forms; book, movies, comics, musical, and so on, I can only write and talk about it so much. That's when I turn my attention to other Mars related movies. The Angry Red Planet has always been one of my favorites, it’s a curious mix of gee-whiz science-fiction and the weird lurid monsters of EC comics and plenty of inspiration from artist Basil Wolverton. MR-1, the first rocket to Mars, returns to Earth after being long out of contact with mission control. There is no response from the crew, and it has to be guided down by remote control. Only two of the five person crew are on board and one of them is suffering from a strange illness. Most of the film is a flashback as they recount landing on Mars and facing down giant spider rats, killer plants and a huge amoeba with one huge revolving eye. The acting is passable for characters that are thinly written at best. They have all the hallmarks of standard science-fiction movie characters from the period: There’s the stalwart scientist (Les Tremayne), the annoying comedy relief (Jack Kruschen), the assertive woman who just needs the firm hand of a good man (Narura Hayden), the manly hero (Gerald Mohr) and the guy who gets killed early on so we know there is danger. The Angry Red Planet represents a real dichotomy in terms of how it’s filmed. All the Earthbound scenes at the beginning and end couldn’t be shot in a less interesting fashion. The shots are flat; they look cheap and are filled with stock footage. The Mars scenes, on the other hand, are terrific. The film is printed in negative with a red tint to it (or Cinemagic as it was advertised), making everything look bizarre and otherworldly. The effect is on screen just about the right amount of time before you get tired of looking at it. The real highlight of the show are the monsters, and the movie is happy to put them on display. Among the creatures we get to see are a killer plant, a giant rat-spider, and a huge amoeba. I was surprised at the amount of gore in the movie; you don’t expect to see a lot of monster blood or someone getting digested in a film from the fifties. 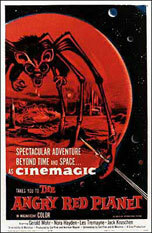 1950’s movies where we invade Mars are much harder to come by than movies where Mars invades us. This is primarily due to the budget constraints of trying to replicate another world, but also the prevalent fear of the time was about “us” being invaded by a mysterious other (commies, teenagers, independent woman, etc.) This is one of the things I’ve always found subversive about The Angry Red Planet, not only are we the invaders, but for all the Martians' power, they fear us. Why else would they send the crew home with a stern warning, instead of wiping them out? *Bonus Tiny Book Review: Ib Melchoir: Man of Imagination by Robert Skotak. The director and writer of 'Angry Red Planet' led a pretty amazing life. On top of doing work on Tom Corbett: Space Cadet, and Robinson Crusoe on Mars (1964) he was also a World War II hero, did just about every job you can think of in the entertainment industry, wrote the short story that would become Death Race 2000 (1975) and was one of the creators of Lost in Space. It's a great compact biography of a very interesting and talented man.